The Merlo Family Vineyards estate is located on the riverbanks of the wild and scenic South Fork of the Trinity River at the southern tip of Trinity County. Surrounded by 8,000 ft intercoastal mountains on all sides, these isolated vineyards are higher than most California vineyards at an elevation of 1,250 feet. Over 45 acres are currently planted with a variety of grape types using quality clone on terroir and site-specific rootstocks. Our vineyards include blocks of Chardonnay, Pinot Noir, Zinfandel, Syrah, and Cabernet Sauvignon. The soils in Merlo Family Vineyards are of three distinctly different origins. The low-lying ground is young alluvial infill. Half of the vineyard is rock, gravel and sand deposited during the 1964 flood. This major event deposited over 30 feet of new material in the Pelatrue Creek Drainage. The creek spilled over into the Merlo Family Vineyard, eroding and baring old pastures. About 70% of the vineyard is infill deposited by the flood event. These soils are mixtures of rock, gravel, and sand base with decomposed granite silts deposited in varying depths on the surface. The remaining soil is heavier native clay from shale origins that have been uniformly deposited from the shale cliffs behind the vineyard. All of the soils are well drained and are actively irrigated. Merlo Family Vineyards has an extremely active and integrated vineyard management program headed by enologist and viticulturist, Steven Canter. “The Hyampom Ranch is a fairly low vigor sight. Afternoon winds and quick draining soils with little water holding capacity make routine irrigation necessary," says Steven. From early June through August each block receives two weekly irrigations that vary between 6 and 12 gallons each, depending on the weather. In September, water is carefully monitored to keep plants under deficit irrigation without compromising the canopy or fruit integrity. The vineyard is planted on 8’x6′ spacing and production is kept to 2½-4 tons per acre. Two shoot/fruit thinning passes are made each year to promote quality. The vineyard is thinned prior to verasion to adjust the overall crop load. A second thinning pass is made after verasion to remove fruit that is damaged or behind in maturity. Secondary crop, depending on the year, is removed at this time to stall or accelerate ripening. In regards to soil management, Merlo Family Vineyards is actively cover-cropping to build organic matter resulting in increased nutrient and water holding capacities of the vineyard soils. As the soils are built, suitable nutrient cycles are planned with leguminous crops and the minimum of nutrient addition. “Our goal is to continue to use sustainable farming practices while improving grape quality," says Steven. “We are committed to responsible farming practices without losing focus on wine and grape quality goals." Merlo Family Vineyards was founded on the concept that quality wine is grown in the vineyard. “We are committed to making wines that are true expressions of the varietal fruit from which they are made," says Ray Merlo. The unique growing season of the Hyampom Valley produces exceptional fruit with a high natural acidity resulting in very structured wines with deep, elegant, and yet, fresh, fruit flavors. A minimalist approach is taken in the wine cellar, allowing the wines to clearly reflect the varietal character and distinct terroir of Hyampom Valley. The Merlo’s believe that the only way to truly make great wine is to grow great fruit. Hyampom Valley has been a source of inspiration to the Merlo Family. “The fruit expresses such a strong sense of place. I want the unique characteristics of Hyampom Valley fruit to shine through, so that each wine is an elegant expression of the land." The Merlos have always believed that it is their job to showcase the unique character, vibrancy and concentration in the fruit – to carefully preserve the varietal character while layering in balance, structure and elegance. The result is wines boasting bold flavors and smooth tannins with elegant balance and acidity. Tucked away in the far reaches of Northern California lies Hyampom Valley – a remote river valley hidden amongst the towering 8000 ft. intercoastal mountains of Southern Trinity County. 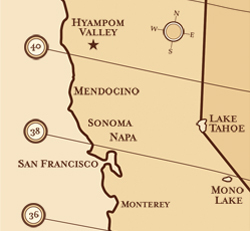 Hyampom, the Wintu Indian phrase for “plentiful valley", is a fitting name for one of the most remote and perhaps most ideal, winemaking regions in California. Located roughly 100 miles north of Sonoma and Napa Counties, Hyampom Valley’s growing season is a full three to four weeks later than that of the wine country. This allows for a much slower ripening, increasing hang time and creating full concentrated flavors without over ripening or depleting natural acids. The valley’s wind-flow drives the terroir of the small mountain valley, causing the fluctuation in temperature and resulting humidity. Daily inland temperatures are regularly above 95 degrees F. Due to the strong coastal influences, each night the valley fills with cool moist air flowing downhill from the majestic, forested mountains that encircle the valley. This results in daily temperature fluctuations of up to 50 degrees F. The contrast in temperatures creates a rich and complex tannin structure that gives the wines strong backbone. The shaping of Hyampom Valley has been a fairly violent mixture of erosion and continental up-lift. It is composed of approximately 2000 acres of arable land and is isolated from the rest of the world by high mountains which surround it on all sides. The valley is spotted with coastal serpentines, ancient shales, unusual metamorphic rock and decomposing granites. A lead of carboniferous shale crosses the valley near the middle and croppings of coal are found in the river and on the hillsides. The best exposure occurs in the bed of the river which lies between the vineyard and the airstrip. Hyampom’s rough mountain topography, combined with the large seasonal flow of local streams, carry liberal quantities of mineral soils and large aggregate to the valley floor. The result is a cornucopia of soil variability.